Since it first aired in 2011, Game of Thrones galloped up the ratings to become the most watched show in HBO’s history. It is no secret that creator George R.R. Martin was inspired by late 15th century Europe when writing A Song of Ice and Fire, the sprawling saga on which the show is based. Aside from the fantastical elements, Game of Thrones really does mirror historic events and bloody battles of medieval times—but how closely? 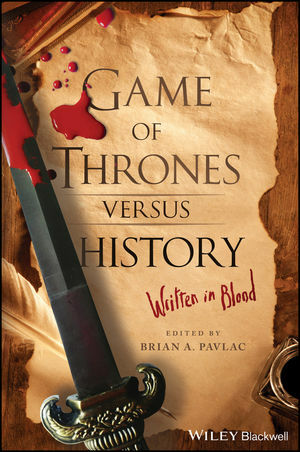 Game of Thrones versus History: Written in Blood is a collection of thought-provoking essays by medieval historians who explore how the enormously popular HBO series and fantasy literature of George R. R. Martin are both informed by and differ significantly from real historical figures, events, beliefs, and practices of the medieval world. From a variety of perspectives, the authors delve into Martin’s plots, characterizations, and settings, offering insights into whether his creations are historical possibilities or pure flights of fantasy. Topics include the Wars of the Roses, barbarian colonizers, sieges and the nature of medieval warfare, women and agency, slavery, celibate societies in Westeros, myths and legends of medieval Europe, and many more. While life was certainly not a game during the Middle Ages, Game of Thrones versus History: Written in Blood reveals how a surprising number of otherworldly elements of George R. R. Martin’s fantasy are rooted deeply in the all-too-real world of medieval Europe. Find suggested readings, recommended links, and more from editor Brian Pavlac at gameofthronesversushistory.com. Brian A. Pavlac is Professor of History at King's College in Wilkes-Barre, Pennsylvania, USA. His books include A Concise Survey of Western Civilization: Supremacies and Diversities throughout History, 2nd Edition (2nd Edition, 2015), Witch Hunts in the Western World: Persecution and Punishment from the Inquisition to the Salem Trials (2010), and Warrior Bishop of the Twelfth Century (2008).